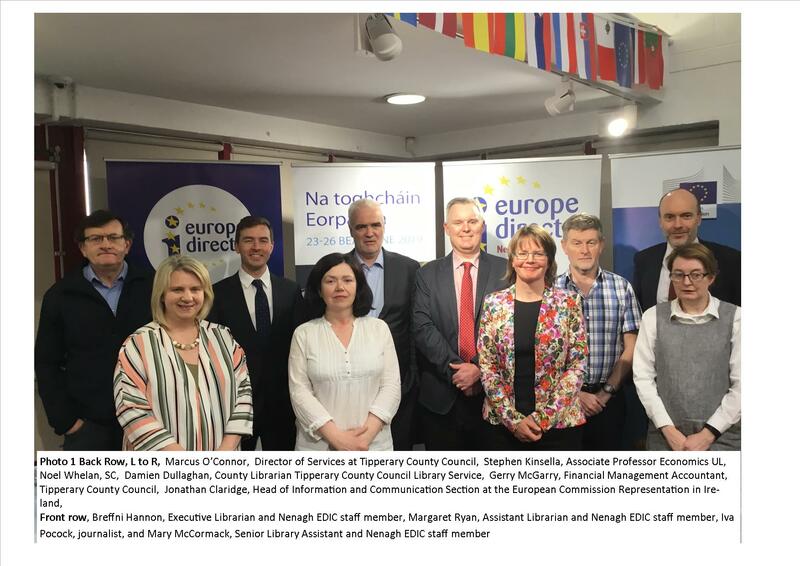 Nenagh library, as Europe Direct Information Centre (EDIC) for counties Tipperary, Limerick, Cork and Kerry, held a very successful citizens dialogue on Thursday, 4th April as part of their Programme of Events for 2019. With polling day for the European elections on Friday 24th May, our talk on the ‘EU and ME….what has the EU ever done for me? was timely indeed. Speakers on the night were Noel Whelan SC, political analyst and columnist with the Irish Times and Stephen Kinsella, Associate Professor of Economics, UL and columnist for the Sunday Business Post with the journalist Iva Pocock moderating the Question and Answer session which followed. In truth the idea of a discussion on the importance of the European Union, the benefits to Ireland of our membership and the significance of the upcoming European Elections in May could potentially have made for a ‘worthy but dull’ topic in the hands of lesser speakers. But both Noel and Stephen brought their own personal views as well are their expertise and practical experience of politics to bear on this weighty subject, which made for a fascinating discussion. Of course, to have a proper dialogue we needed to hear from the audience too and they did not disappoint, giving their views on the pros and cons of increased European integration, the disconnect felt by different member states towards the EU and the need to bridge this gap in communication. Iva Pocock as moderator, skilfully handled the questions from the audience and, having lived in Brussels herself for 6 years, was well placed to discuss the subject. Making the point that international problems can only be solved at international level and referencing John Hume’s view that the way to solve intractable conflict is through economic cooperation and the integration of lives, Stephen spoke of the European Union’s raison d’etre which was to promote peace between countries who traditionally were in conflict with each other eg France and Germany. Set up with the aim of ending the frequent and bloody wars between neighbours, which culminated in the Second World War, the European Union’s greatest success has been in preserving the peace in Europe for almost 70 years. Through economic co-operation and integration, the European Project has successfully diluted the clash of identities and the ensuing conflict. Both speakers felt that Ireland’s relationship with the EU has been beneficial. Noel spoke of the extraordinary importance of the European ideal of cooperation and integration when it came to Ireland in that it allowed us ‘first of all to raise our eyes from the ground and then to turn away from the UK to look towards Europe.’ That was a huge milestone for us in our growth as a nation and is perhaps the reason why our outlook on the EU is generally positive and less contentious than other countries. The European Union gave us ‘the strength to look outwards at the world and say we are not dependent psychologically, culturally, socially or economically on our inevitably dominant and once occupying neighbour.’ When speaking of the positive influence membership of the EU has had on our daily lives, transforming as it did our own perception of ambition, he reminded those present of the grants available for education down through the years under European Social Funding which allowed young people, who may not otherwise have gotten the chance, to go to college and he spoke of the need now to step up and give back to Europe. Stephen pointed out that with a population of over 500 million within the Union and Ireland realistically not even the size of a small city in Germany, we definitely punch above our weight in terms of representation, giving as examples, Pat Cox, a former President of the European Parliament and Mairead McGuinness, currently the first Vice-President of the European Parliament as well as Philip Lane, widely regarded as one of the finest economists in Europe, who has just been appointed to the European Central Bank’s executive board, thus marking the first time Ireland will be represented on the bank’s six-member executive board. Noel had started his talk with the point that ‘we live in interesting times’, saying that in truth, for each generation their own time is interesting. But there is no doubt that we live in ‘complicated’ times and across Europe, nationalist and far-right parties have made significant electoral gains. Fears of a dilution of national identity and loss of national sovereignty in the face of overarching EU policies have fed into a long held Euroscepticism, resulting in a turning inward amongst several countries. While Noel doesn’t see us falling into the trap of populism as has happened in the UK and USA, we cannot afford to be complacent. The European elections should be as important to us as our local and national ones, ensuring we send the best and brightest to represent us in Europe. This talk was a Citizens Dialogue on The EU and ME..What has the EU ever done for me? as part of Nenagh EDIC’s message to everyone to make their voice heard on Friday 24th May. We would like to thank most sincerely our speakers Noel Whelan and Stephen Kinsella and our moderator, Iva Pocock. We would like to thank also Jonathan Claridge, Head of Communication at the European commission Representation in Ireland and all those who contributed to this talk. The below websites contain all relevant information on voting in the European elections and we would advise everyone to check that they are registered to vote and to ensure that they are heard on Friday May 24th.